On our wedding day Pete and I walked up a field, while all of our friends sat on blankets and watched us get married in glorious sunshine. We then drank cider sitting around on the grass and played games, before we headed into a traditional canvas pole marquee for dinner and dancing. 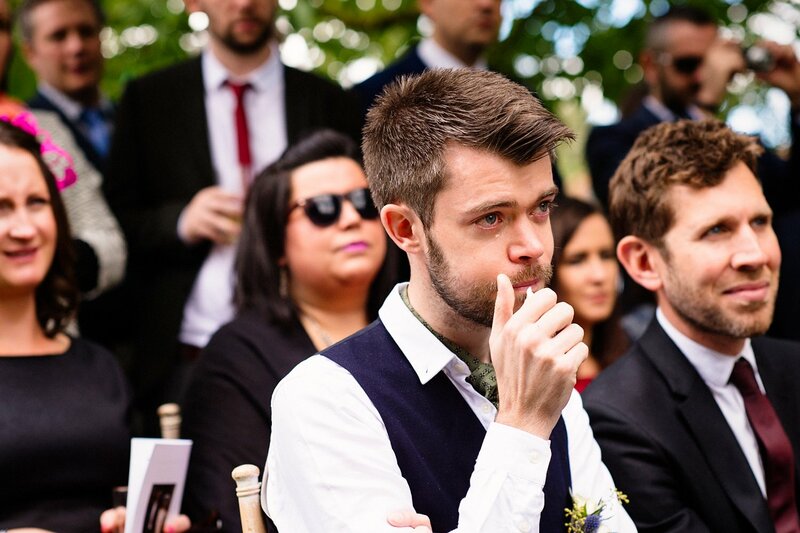 It was all rather lovely and there something wonderful about an outdoor wedding, where you’re surrounded by the elements, instead of being constrained by walls as you say your vows. 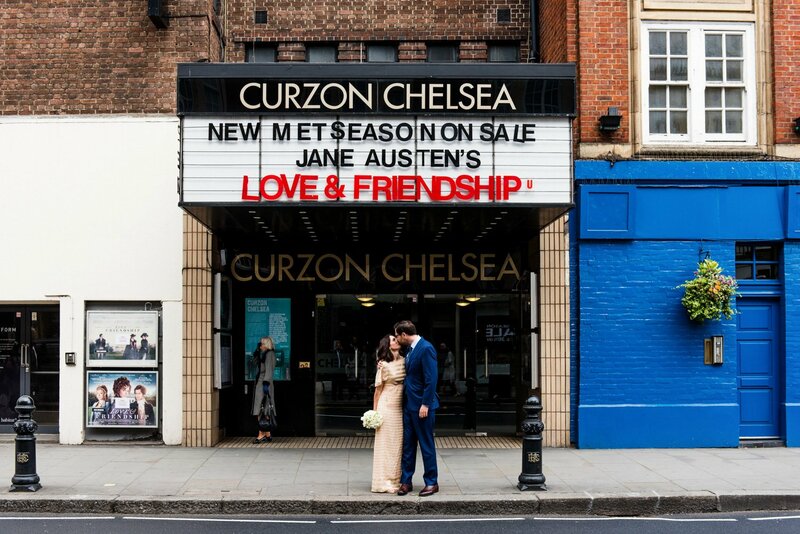 Unfortunately in England you can’t legally have an outdoor wedding but that doesn’t mean you can’t have the wedding you want, you just need to get creative to make sure you’re legally married at the end of it. Or not – maybe you don’t even care about the legal bit and you just want to affirm your love for each other. Either way, here are some tips for having an outdoor wedding, including suggestions and things to consider when you’re planning your wedding celebration. And don’t forget to get in touch and we can chat about me photographing your outdoor wedding for you. The legal way is to pick an outdoor wedding venue that has a licensed structure. 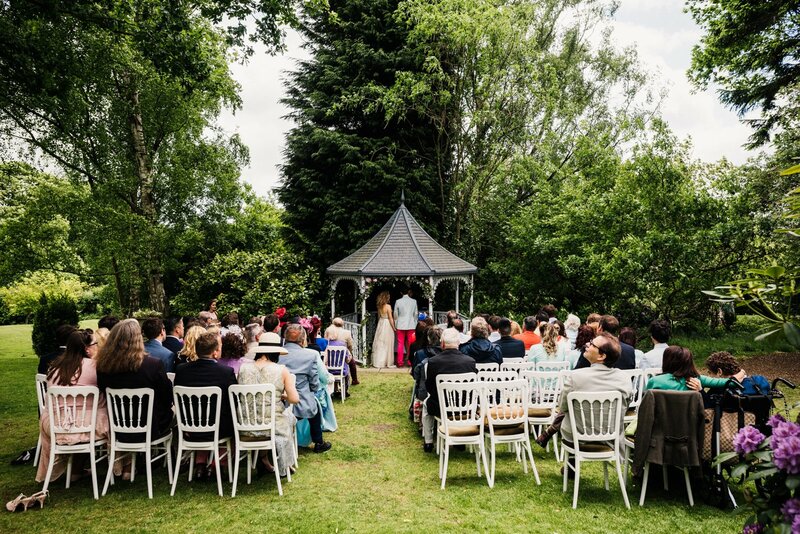 Structures like arbours, gazebos and pavilions can be licensed for marriages, which means you can stand inside them while you say your vows, to comply with the law. I’ve photographed weddings at Wassing Park’s Secret Walled Garden and Crook Hall and Gardens where my couples have taken this approach. For lots of couples it’s really important that their legal vows are part of their ceremony on the wedding day, so this is a good way of making sure that’s the case. One downside is that you’ll be inside quite a small structure, while your guests all sit outside. This can be a bit of a nightmare for photography if it’s sunny, as you’re inside where it’s dark while your guests are outside in bright sunshine. The other option is to do the legal bit separately. The huge benefit to this is that you effectively get two weddings and you’re not constrained by any specific regulations when it comes to the ‘main’ wedding ceremony. 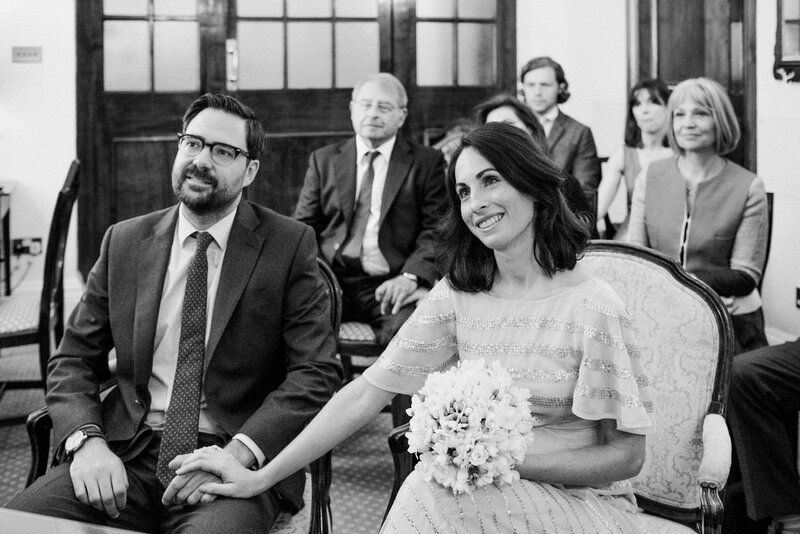 Ara and Alistair were married at Chelsea Town Hall with just their closest family members present and after their ceremony they went for an intimate lunch straight afterwards. They’ll be having a big celebration with all of their friends in Spain at a later date. Laura and Brian did their legal bit at a town hall in Brian’s native Scotland, so they could have a Humanist wedding at West Lexham in Norfolk. After their legal ceremony they went for afternoon tea. If you want to make the official / legal bit really intimate you might want an elopement, where it’s just the two of you. Some venues will offer the option of saying your legal vows inside, before heading outside to exchange personal vows. 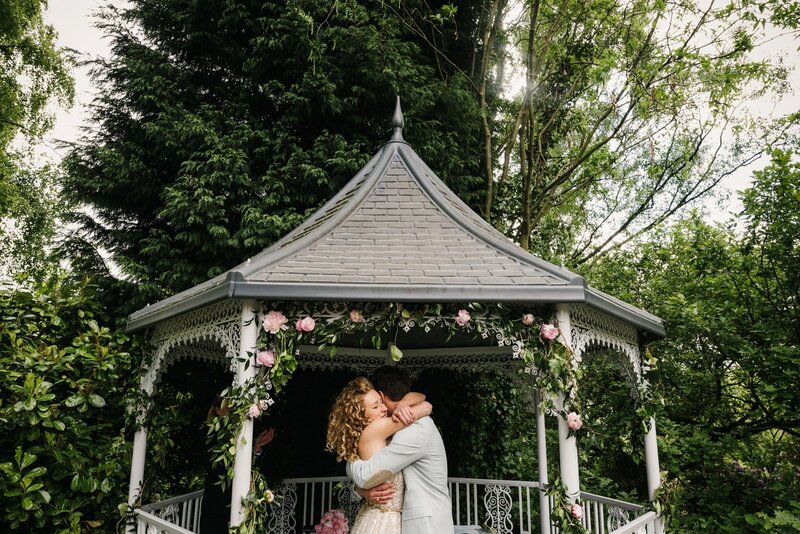 I photographed a wedding at Dewsall Court where the couple said their legal vows inside the house and then had the rest of their ceremony in a yurt, in the garden. Rob and Rosie took this a step further and they were married in Rosie’s village church with just their immediate family in attendance. 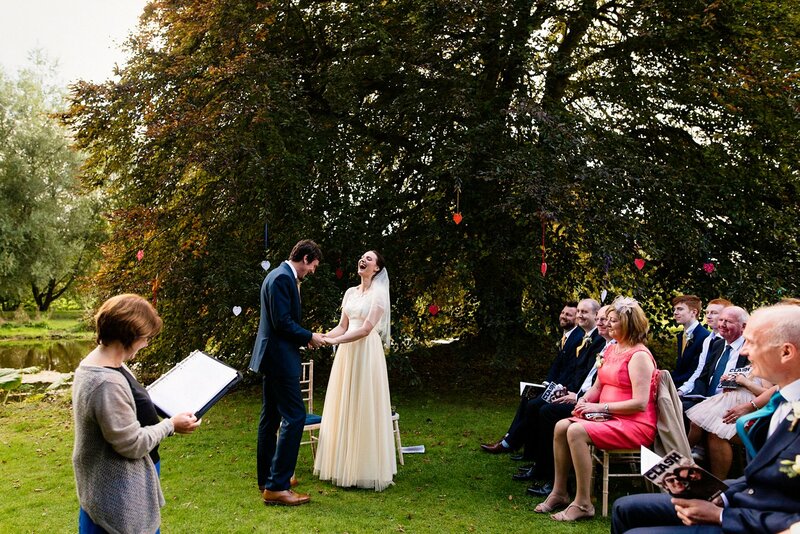 When the religious (and legal) ceremony ended they made their way to Rosie’s family home where a family friend conducted an outdoor wedding ceremony in front of all of their friends and family, under Rosie’s favourite tree. Once you have the legal bit covered, you can look at creating a personal wedding ceremony that really reflects you as a couple. You could ask a friend or family member to conduct the ceremony or you could work with a celebrant. 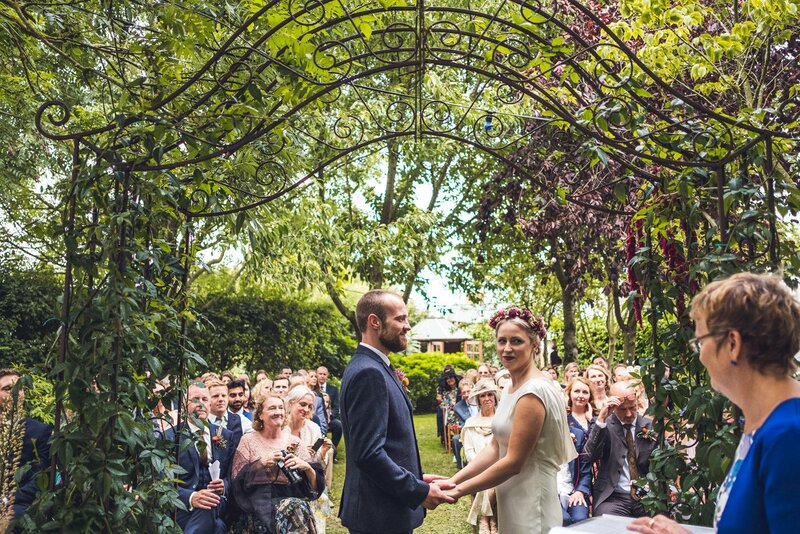 Jessie and Ed were married in the garden of Jessie’s family home with all of their friends and family watching. They had a humanist celebrant to conduct the wedding ceremony, which took place outside. It magically stopped raining just an hour before the ceremony. Ahh good old Blighty and our ever unreliable weather. 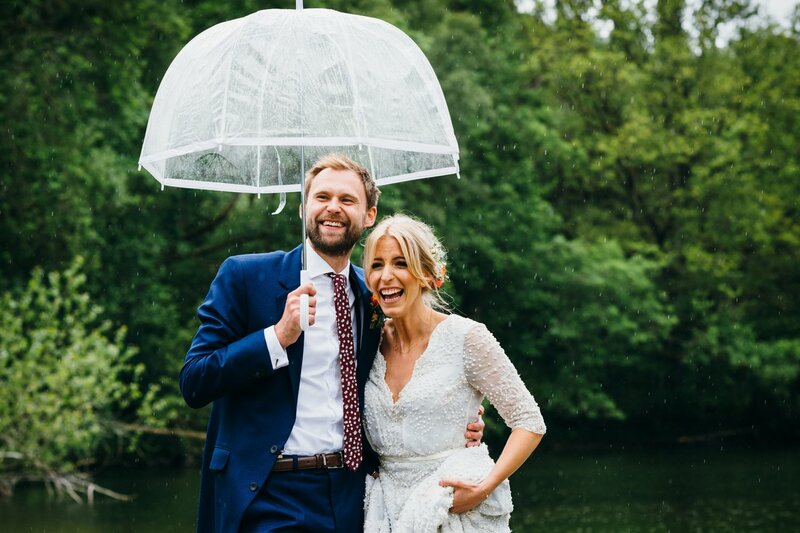 It’s June as I write this and it’s been drizzling for three days straight, so it’s a good idea to have a wet weather back up plan if you’re planning an outdoor wedding in the UK. Alternatively you could just embrace it like Luke and Pip. If you’re not prepared to brave the elements, is there a room inside you can move your celebrations to if the heavens open? 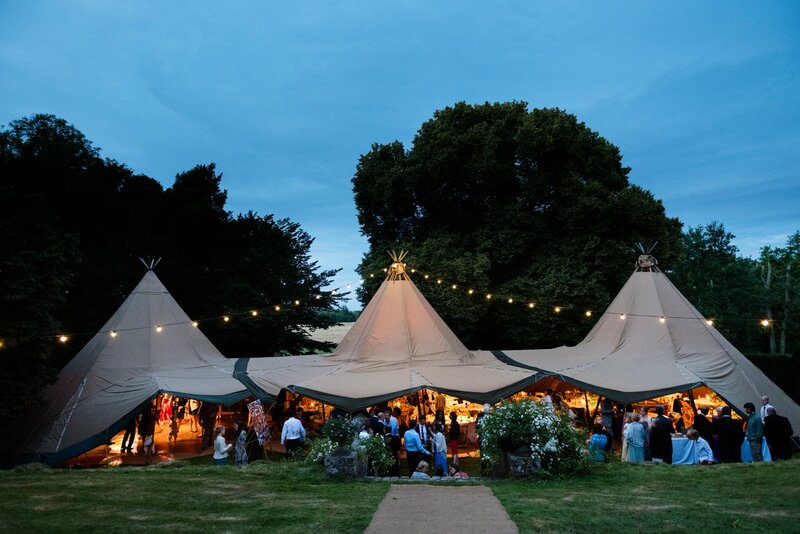 Do you have a marquee / tipi or any other structure on site that you can use as a back up? 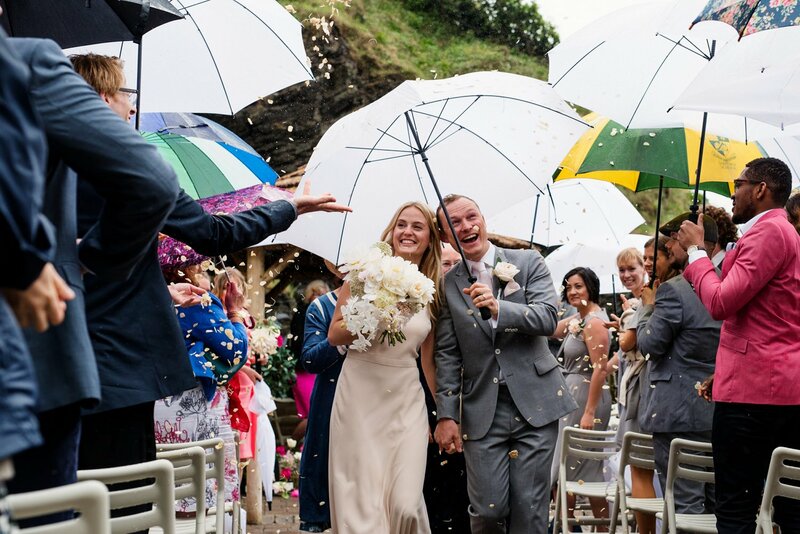 At the very least think about hiring in enough brollies for everyone to stand under if needs be (and they can double up as parasols too – bonus!). If you’re going solo (i.e with no venue to coordinate things for you) think about power – your generator will need to be powerful enough to supply lighting, your band’s pa system, any bar fridges etc. You’ll also need to hire toilets, make sure drinking water is available and think about keeping your drinks cold. Be clear about your dress code. If you’re going to be outside in the evening tell your guests to wrap up warm! On the flip side provide plenty of water during the day (and maybe some sunscreen and bug spray!). And likewise think about your own outfits. Very formal attire might be too hot or constricting if you’re outside all day, and you might also want something warm to wear in the evening. The right lighting will make sure none of your guests fall down a ditch. 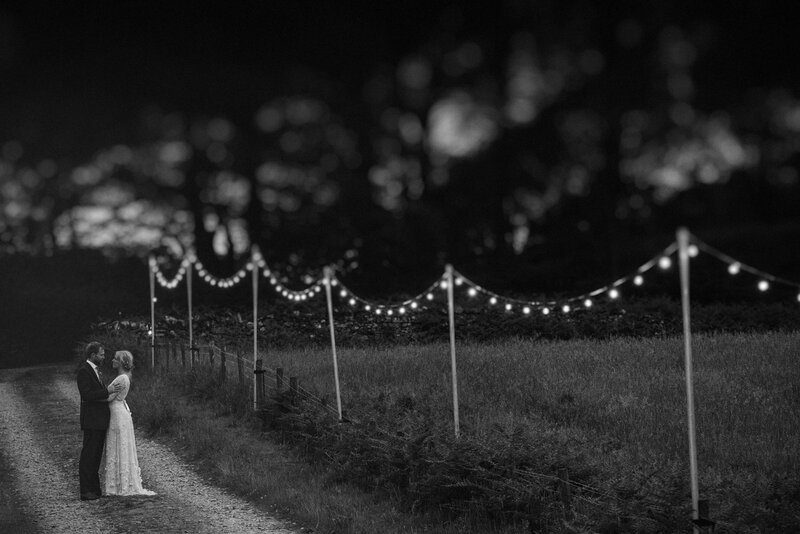 Put lights around the edge of your site to define it, drape trees with fairy lights, put tealights in decorative bags (weighted with sand so they don’t blow away) and add festoon lighting (my favourite!) for that festival feel. 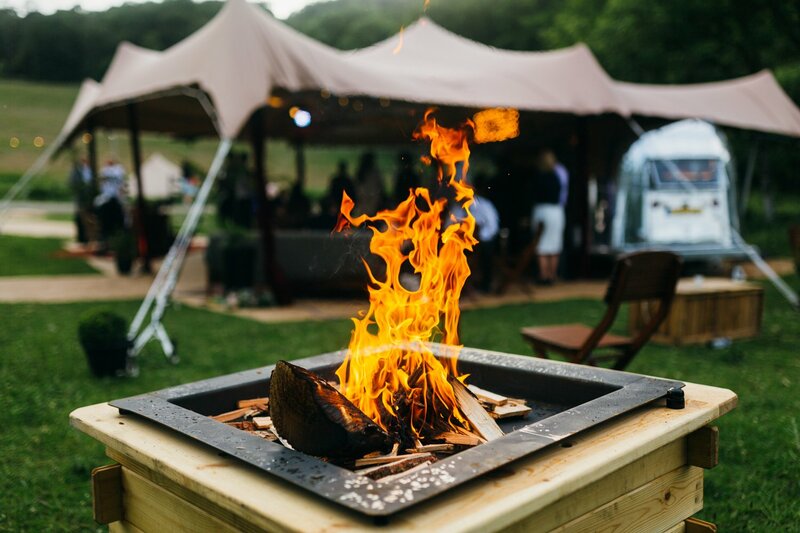 Fire pits will give guests a focal point to gather around and keep them cosy too. You can provide marshmallows for toasting. Yum. And finally, get in touch if you’d like to talk to me about photographing your outdoor wedding. 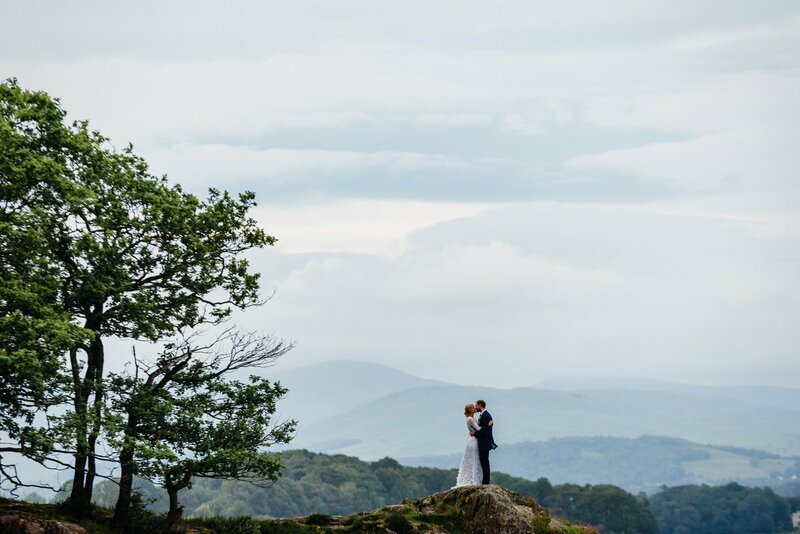 I’m always really happy to work with my couples to work out where the sun will be located during your ceremony, to make sure it takes place in the best light possible. I can also talk to you about the importance of light when it comes to planning your portraits. Outdoor weddings are my favourite and I’d love to be a part of yours.